The open practice will take place from 11 am. to 1 p.m. Saturday. 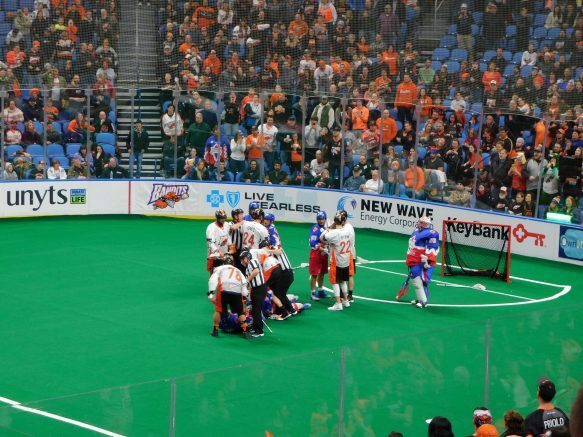 The Buffalo Bandits will open the KeyBank Center doors on Saturday, Dec. 1 for fans to get their first glimpse of the 2018-19 Bandits squad at the team’s annual open practice. Practice is scheduled for 11 a.m. to 1 p.m. and fans will have the opportunity to get autographs from their favorite players following the conclusion of practice. The event is open to the public as a free, non-ticketed event with general admission seating. Parking for the day will be free in the KeyBank Center parking garage. The Bandits will be hosting a Q&A session during practice with players, coaches and team personnel throughout practice on the HD videoboard. Fans are encouraged to submit questions for the Q&A via the Bandits Twitter account up until Friday, Nov. 30 using the hashtag #BanditsCamp. The event will also feature a team garage sale, offering fans the opportunity to purchase practice jerseys, locker nameplates, sticks, photos and a wide variety of other Bandits memorabilia. The Bandits will also host the team’s annual select-a-seat promotion before and during practice, giving fans the chance to choose their seats and purchase 2018-19 season tickets. Individual game tickets for the 2018-19 season are now available and can be purchased in person at the KeyBank Center box office, online at Bandits.com/Tickets or by phone at (888) 467-2273. Be the first to comment on "Buffalo Bandits to host open practice on December 1"